For such a simple, elemental food, known for providing low-cost protein to the masses, I find that beans can be tricky to get right. By tricky I mean a little fussy, requiring more care than you might expect. You would think that cooking beans is a simple matter of boiling them in water until they soften to an edible state. This is mostly true, but for perfectly textured beans — beans that hold their shape and whose interior is pleasingly tender — cooks must give minimal but careful attention when shopping and cooking. Like complaints about steak, the most common complaints regarding cooked beans have to do with their doneness. They are either falling apart (overcooked), chalky and crunchy (undercooked), or they have cooked unevenly — some beans are mushy, while some are too firm. The key to cooking a delicious pot of beans is knowing a bit of background about different bean varieties, appropriate cooking vessels, and temperature. Don’t get me wrong, I’m not trying to turn beans into gourmet food. I’m just saying that when it comes to eating a bland starch like that contained in legumes, there’s a big difference between OK and excellent. And you want your beans to be flavorful, so satisfying that you'll find yourself standing alone eating them in the kitchen, sprinkling a little salt and drizzling a little olive oil over them as you go. Canned beans do not offer this kind of appeal. While canned beans are useful, and in my opinion a necessary convenience (a filling bean-and-cheese quesadilla is dinner 9-1-1 for preschoolers), they are truly second-best in taste and flavor compared to beans cooked from scratch. As a bonus, the liquid left over from cooking your own beans is a miracle broth when stirred into soups, adding a round, mellow flavor. Large white beans in particular leave lots of starch in their cooking broth, making it almost gelatinous, like a meat stock. Vegetable-based soups can seem thin or watery, but adding leftover bean “stock” gives them body. A great deal of lore circulates about how to cook beans, most of it focused on avoiding digestive difficulties. Beans contain carbohydrates that our bodies cannot digest. Food scientist Harold McGee says that when beans pass through our lower intestine, bacteria break down what our digestive enzymes cannot, causing gas. Yet McGee eschews soaking beans as a technique to combat flatulence. Not only does soaking leach out the difficult carbohydrates, he says, but it also removes vitamins, minerals, and flavor, especially if you discard the soaking water. Instead, McGee recommends long, slow cooking. This, he says, breaks down beans’ carbohydrates into digestible sugars. I have cooked a lot of beans and I agree with McGee: It is essential to cook beans thoroughly. But even better is how beans taste when they’re slowly cooked. Plenty of time in the oven or on the stove over low heat yields creamy and luxurious beans. Slow cooking also gives beans a chance to absorb the flavors of any herbs, fats, and aromatic vegetables you might have added to the pot. Beans should be cooked at a gentle simmer in a wide pot, so that each bean simmers in hot liquid without getting crushed. 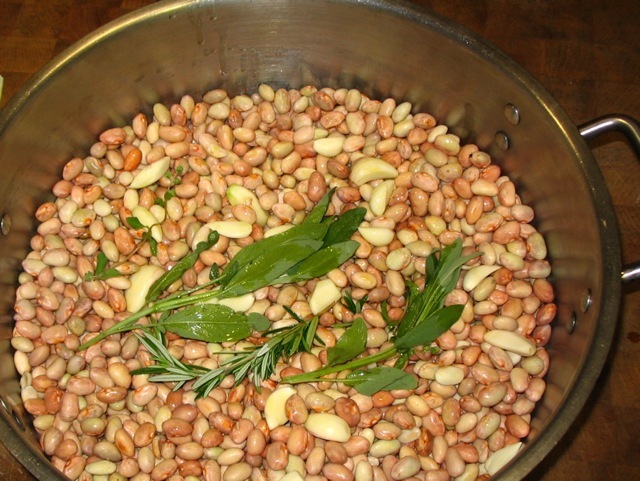 Boiling will eventually blow apart your black-eyed peas, flageolets, and cranberry beans. Though I endorse slow cooking, I won't go so far as to discourage all bean presoaking. For one, beans do cook more quickly if soaked ahead of time. More importantly, making beans easy to digest, in my opinion, takes precedence over preserving every single nutrient. After all, if you associate beans with discomfort for you or those you're feeding, you’re not likely to eat them in the first place, in which case you reap none of their abundant health benefits. Those benefits include fiber and vegetable protein. A bean combined with a grain provides a complete protein. Beans are free of cholesterol and saturated fat as well. And their low glycemic index makes them a good choice for diabetics. Because beans take a long time to digest, you're left feeling full for longer. You get a steady energy from beans, as if the fuel you’re getting is on timed release. Many of the common frustrations of cooking beans — they cook unevenly, the skins remain tough even when the insides are soft, or they take longer than two hours to soften — can be sidestepped by finding beans that haven’t been stored an excessively long time. Ideally, beans should be cooked within one year of their harvest. The conundrum here is that beans are often sold in bulk, so how can you tell how old they are? Check their appearance. Beans that have been stored too long split, crack, and chip. Your best approach is to look for beans grown in your region. I had not realized how sweet and light chickpeas could taste until I got some from a co-op of farmers in a neighboring state. The peas’ high quality could have been related to a number of factors: the variety of garbanzo or how it was sown and grown, for example. I’m betting, though, that their pure taste, free of the off-putting funk I sometimes detect in chickpeas, was because the beans were fresh. “Dried fresh” seems like an oxymoron, but the truth is that most foods lose flavor the longer they sit on the shelf. OK, so maybe a recommendation to buy local dried beans is a bit of a stretch. And, honestly, it’s not possible in every climate. But the larger point is this: The only way to avoid old beans is to learn their harvest date, which is easy to do if you buy directly from farmers or look for packaging that identifies where and when the beans were harvested. [%image beans float=right width=400 caption="Look for beans grown in your region."] If this is too difficult, buy beans in bulk at a store with rapid turnover. Sure, without a label identifying the brand or producer, you don’t know exactly what you’re getting. But if the beans sell quickly, they are more likely to be fresh. Fat is a good friend to beans. Simmered with a tablespoon or two of lard or extra-virgin olive oil, legumes’ comforting starches become all the more smooth. By lard I mean pure rendered pork fat, not the partially hydrogenated substance sold as "lard." You can find lard at Mexican grocery stores or European-style delis and grocers. I have also added schmaltz, or rendered chicken fat, to my pinto beans, and its effect was almost as good as lard. Add one to two tablespoons of oil or lard, depending on taste, to about two cups dried beans as they simmer. Many cultures cook beans with herbs to aid digestion; for example, Mexican cooks pair epazote with black beans, and East Indian cooks add turmeric, ginger, or the resin asafetida to dals and other dishes. I add them for the subtle flavor they impart. Candidates include bay, rosemary, basil, thyme or sage, cilantro, epazote, ginger, and asafetida. Chop herbs or leave them in sprigs to be removed once the beans have cooled. Adding celery, onions, carrots, and garlic (peeled but left whole) to beans makes them more sweet and more savory. This method, which employs soaking before cooking, works well for dried beans that require a long cooking time, such as black-eyed peas, kidney beans, chickpeas, black beans, cannellini beans, cranberry beans, and pinto beans. Sort beans on a baking sheet. 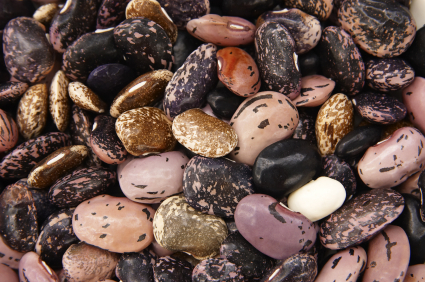 Pick out clumps of dirt, small stones, and discolored, split, or cracked beans. Rinse the beans in a colander under cold running water. Discard soaking water, rinse, and drain beans again. Put beans in a heavy-bottomed, oven-safe pot. A wide pot, not a deep and narrow one, is the best pot for cooking beans; you want the beans to cook evenly without getting crushed. Add cold water to cover the beans by two inches. Bring to a boil, skim off any foam (which is protein, caused by the agitation of the water) that rises to the surface, then turn down to a low simmer. This is a good time to add any fats, aromatics, and herbs you are using. Either simmer very gently on the stovetop, or cover and bake in a 300-degree oven until the beans are tender. Sample several beans before you make this determination; they may cook unevenly. Beans may take anywhere from 40 minutes to two and a half hours to cook, depending on the type, how long the bean has been in storage, the altitude, and the hardness of the water. Check them as they cook. If the water level has fallen below the beans, add boiling water to cover. Remove beans from the heat and remove the lid from the pot. Add salt and allow beans to cool in their liquid; as they sit; the beans absorb the salt slowly. Check the salt level again after about 30 minutes. As they cool, the beans may swell a little more, and their texture may improve.